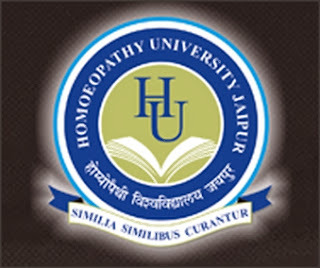 Homoeopathy University Jaipur Ph.D. in HOMOEOPATHY 2015 Apply Now! Eligibility For Internal /External candidate: Candidate having Post-Graduate degree in Homoeopathy from any recognized Homoeopathic Medical College of India & degree should be included in second schedule of CCH act. Note * *User can download application form and submit the same at University . * If a candidate downloads the form, he/she must attach a D.D. of Rs 3000. in favour of Homoeopathy University, jaipur, payble at Jaipur. ** Detailed information of Ph.D. (Homoeopathy) is available on website front page. Homoeopathy University is established by Dr. M.P.K.Homoeopathic Medical College, Hospital & Research Centre Society, Jaipur. The Ordinance of University has been approved by His Excellency Governor of Rajasthan vide their Ordinance No.5 of 2009 on 13-10-2009. The bill of University has been raised in state assembly by the Government and legally accepted through the legislature on 3rd April 2010. University is located in the vicinity of Jaipur at Saipura, Sanganer on a sprawling piece of landscaped earth furnished with latest instruments and top line facilities. University is all set to create the charismatic aura of gentle conciliation that Homoeopathy is all about. Homoeopathy University is going to emerge as a Centre of Excellence in Homoeopathic education & research where learning shall be an ongoing process and knowledge will be exhaustive, where education shall be a tasteful blend of ethics and where grooming shall involve optimum usage of resources to be globally responsive and utilitarian. One of the prime ideas of University is to foster a supportive and vibrant learning environment where faculty, students and professionals cherish a mutual commitment to research and public service. University proposes different kind of medical and Para-medical courses which are of benefits to the students and suffering human beings. B.H.M.S., M.D.(Hom.) and Ph.D. in Homoeopathy, M.Sc. in Biotechnology, Microbiology, and Biochemistry, Pharmacist course, B.Sc. in Nursing, Diploma in herbal pharmacy, Certificate course in Homoeopathy for Allopath, Diploma in Hospital Management, Foundation course for fresh graduates, Introduction to computers, Public relation in Homoeopathic Practice, Medico-legal aspect of Homoeopathic Practice, Introduction to Medical Transcription, Communication skills, Clinical research in Homoeopathy, Modus Operandi of Drug action, Application of Homoeo drugs in Veterinary & Agriculture etc. are the courses which not only provide an ample career opportunity for a young science student, but also help in maintaining good health level in Society. Intelligently laid imploring structures standing generously strewn amidst an ecological friendly environment. Designed to support all the fines nuances of Homoeopathy, this mega structure conforms to all global parameters of excellence.